Includes a pair of matte black 36 inch barrier screens and a single 22 inch matte black barrier screen. Screens are designed to fit Empire Tahoe See Thru and Peninsula direct vent fireplaces. Screens are tested to prevent contact burns with hot glass. Easy installation and will not obstruct view of the flames. *Also Note: A separately purchased LSU24RR log set is required to complete installation. Please see accessories to find this item. These peninsula fireplaces are so attractive and practical at the same time. This direct vent Tahoe Premium natural gas fireplace by Empire features a built in Slope Glaze Vista Burner that generates 35,000 BTUs of radiant warmth, and the Peninsula style allows an excellent view of the flames from three side. This 36 in. fireplace includes black slat louvers, banded brick ceramic fiber liners, dimmer controlled lighting, glowing embers, and a standing pilot with remote ready millivolt controls. This unit requires no electricity and comes with a three year limited warranty. Does this type of fireplace darken the glass viewing windows when used with propane? If so, how do you clean the inside glass? It should not darken the glass. That would be a sign of an issue if it did. You can clean the glass with some Glass Cleaner. Can I use my programmable millivolt thermostat with this unit? Yes, this fireplace is compatible with any millivolt remote control or thermostat. What is the BTU output and what size room would it heat? This unit operates at 35,000 BTU's and can heat up to 1000 square feet. Can you give me the glass dimensions? The glass area on the long sides measures 32 1/2 wide by 22 inches tall. The glass on the short end measures 17 1/2 inches wide by 22 inches tall. These measurements do not include the metal frame the glass mounts to. Does this work at a 7,000 ft altitude? Per the manufacturer, you will need to purchase a separate pilot orifice to use this fireplace at 7,000 feet elevation. Can fire glass be used instead of the logs? This particular model does not have provisions for the burner to be used with glass instead of ceramic logs. When you order the mantel top for the peninsula fireplace, do you also get the side trim pieces in the same wood? Per the manufacturer, the vertical finish panels will indeed be included with the purchase of the upper mantel for this fireplace. Detailed instructions will be provided with the components. Does the unit include the glass doors? What else is needed for installation? This unit will indeed include all three glass panels to fully enclose the appliance. The burner assembly is also built-in. The log set and venting assembly will need to be added to complete installation. Realistic flame pattern. High quality unit. 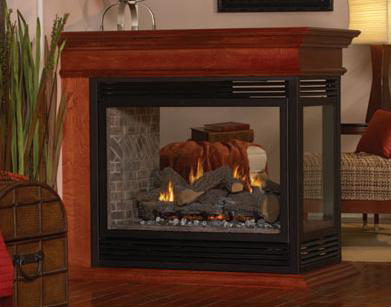 Great looking, affordable gas fireplace and easy to install! Delivery was a breeze and friendly staff! Unit is beautiful. Installation went easily and quickly. Pricing, shipping, and delivery from efireplace.com was reasonable, timely, and went smoothly. If needed, I would definitely consider buying another Empire Fireplace again. 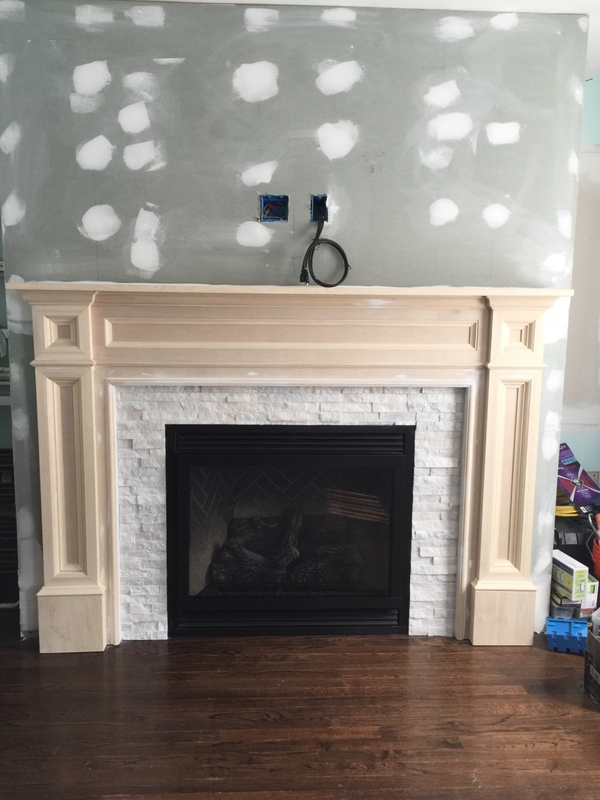 The fireplace came in super fast and was packaged great, The staff were fantastic to work with and had all of my questions answered, the unit is looks GREAT . ProsEverything except my exhaust stack were included in my order, NOTE will be ordering that when we are ready to install. Everything was just as promised and shipping was super fast. Straightforward installation, great source of additional heat for those who need to augment their existing heating in the home. After receiving the peninsula fireplace, I was highly impressed with the looks and quality. I can't wait to use it for the first time in our new home where it will be featured and viewed from our great room. This item has been a pleasant surprise. I was worried about the remote control functioning properly, but it is functioning over my expectations. I really like the thermostat function in the remote that will turn the unit on when the temperature in the room drops below the set temperature. I did some price shopping before I purchased the unit and this unit provided a lot of value for the money I spent. ConsFan could be a bit quieter on the higher speeds, maybe an option for more $$. The fireplace was delivered quickly, came undamaged and the installation was relatively simple. The remote control functions are great, we use the "thermostat" function of the unit to warm up our house. Very nice, high quality. Our family loves it. very easy company to work with. all 4 items I ordered arrived on time. Everything we hoped it would be. Installed easily, with a lot of help from my HVAC pro neighbor next door. Looks great and puts a lot of heat into the room. Natural gas bill for January, total house, $56,00. Great investment. Hi, looks like an awesome fireplace but unfortunately we have to return as it is way too large for the room we plan on putting it in but will look at your other stoves.